TILLING (Targeting Induced Local Lesions IN Genomes) is a reverse genetic method that combines chemical mutagenesis with high-throughput genome-wide screening for point mutation detection in genes of interest. However, this mutation discovery approach faces a particular problem which is how to obtain a mutant population with a sufficiently high mutation density. Furthermore, plant mutagenesis protocols require two successive generations (M1, M2) for mutation fixation to occur before the analysis of the genotype can begin. Here, we describe a new TILLING approach for rice based on ethyl methanesulfonate (EMS) mutagenesis of mature seed-derived calli and direct screening of in vitro regenerated plants. A high mutagenesis rate was obtained (i.e. one mutation in every 451 Kb) when plants were screened for two senescence-related genes. Screening was carried out in 2400 individuals from a mutant population of 6912. Seven sense change mutations out of 15 point mutations were identified. This new strategy represents a significant advantage in terms of time-savings (i.e. more than eight months), greenhouse space and work during the generation of mutant plant populations. Furthermore, this effective chemical mutagenesis protocol ensures high mutagenesis rates thereby saving in waste removal costs and the total amount of mutagen needed thanks to the mutagenesis volume reduction. Rice (Oryza sativa) is one of the most important food crops in the world. It is also a model cereal plant  for molecular biology and genetics due to its small genome size relative to other cereals, the availability of the entire genome sequence , it’s ease of transformation and regeneration, and the availability of a variety of mutants. Since sequencing of the rice genome was completed in December 2004 , functional genomics has been used to determine the function of all of the approximately 50,000 annotated genes [3, 4]. This objective has already been reached through the development of a variety of gene knockout strategies [5–7]. There are 3 ways in which to induce mutations, by either using: 1) biological agents such as transposons and T-DNA, 2) physical agents such as fast neutron, UV and x-ray radiation, or 3) chemical agents such as N-methyl-N-nitrosourea (MNU), 1,2:3,4-diepoxybutane (DEB) or ethyl methanesulfonate (EMS). Among these compounds, EMS has become one of the most effective, reliable, powerful and frequently used chemical mutagens in plants . EMS mainly induces C–to-T substitutions resulting in C/G to T/A transitions [9, 10] and at a low frequency, EMS generates G/C to C/G or G/C to T/A transversions through 7-ethylguanine hydrolysis or A/T to G/C transitions through 3-ethyladenine pairing errors [9–12]. Irradiation and chemical mutagenesis have long been used to produce mutant plants for breeding proposes [13, 14]. Molecular screening of mutations was developed much later after the efficiency of chemical mutagens producing small deletions and point mutations had been improved [8, 9, 15, 16] and DNA sequencing allowed for the identification of such point mutations. Nevertheless, direct sequencing in large populations is a slow and expensive process. Therefore, several mutation detection techniques based on physical properties were developed [17–24] before enzymatic mismatch detection methods provided the key to efficient mutant population screening. The endonucleases obtained from Aspergillus, Vigna radiata or Penicillium were the first enzymes used to detect DNA mismatches. Oleykowski et al. improved this technique by using the CEL I endonuclease obtained from Apium graveolens combined with an electrophoresis step, thereby paving the way for high throughput screening technology. Since then, the enzymatic detection methods in combination with high throughput genotyping have been improved for the efficient detection of genetic polymorphisms [29–32]. Consequently, there has been growing interest in using irradiation and chemical mutagenesis in model organisms for use in functional genomics research [33, 34]. Chemically induced mutant populations have been generated in different plant species  and efficiently screened following Targeting Induced Local Lesions IN Genomes (TILLING) high-throughput screening protocols [35–37]. These combine random chemical mutagenesis with polymerase chain reaction (PCR) amplification of target genes, heteroduplex formation and identification of a range of allele changes  by using enzymatic mismatch cleavage and electrophoresis. Achieving a genome-wide saturated mutant population in plant species with large genomes is challenging. Small genome species such as rice are more suitable for TILLING [30, 39, 40]. As a result, many rice mutant populations have been efficiently screened using this technique [36, 41–43]. In TILLING chemical mutagenesis protocols, germinating seeds are incubated in a mutagenic solution. The first generation (M1) that is produced directly from the mutagenic treatment cannot be screened because the majority of generated mutations are somatic and are not transmitted to the progeny . To solve this problem, the M1 mutant population has to be grown and then self-fertilized. The mutations in M1 sexual structures can produce whole mutant M2 descendants, thereby avoiding any ambiguities caused by mosaicism. The resulting M2 progeny can be screened for mutations. Tissue culture methods and mutagenesis techniques currently available could significantly shorten the breeding process and overcome some substantial agronomic and environmental problems. In most cases, the embryo-derived rice callus regeneration is only generated from a few cells. Thus, the regenerated M1 plantlets from mutant calli could be screened directly without waiting for a self-pollinated M2 population. Few attempts at mutagenesis for breeding purposes in rice using immature embryos, calli derived from mature seeds or single zygotic cells in recently fertilized spikelets have been reported [44–47]. Recently, mutagenesis of suspension-cultured rice cells for phenotypic detection of mutants has been reported . However, to date no studies of chemical mutagenesis in mature seed-derived rice calli in order to obtain mutant populations for TILLING have been reported. The aim of this work is to carry out a new TILLING strategy based on the production of a plant mutant population from EMS mutagenised embryo-derived calli followed by a mutational screening on the regenerated plants. This mutational screening focusses on two genes related to senescence since this developmental process in annual cereal crop plants overlaps with the reproductive phase and may reduce crop yield when it is induced prematurely under adverse environmental conditions. 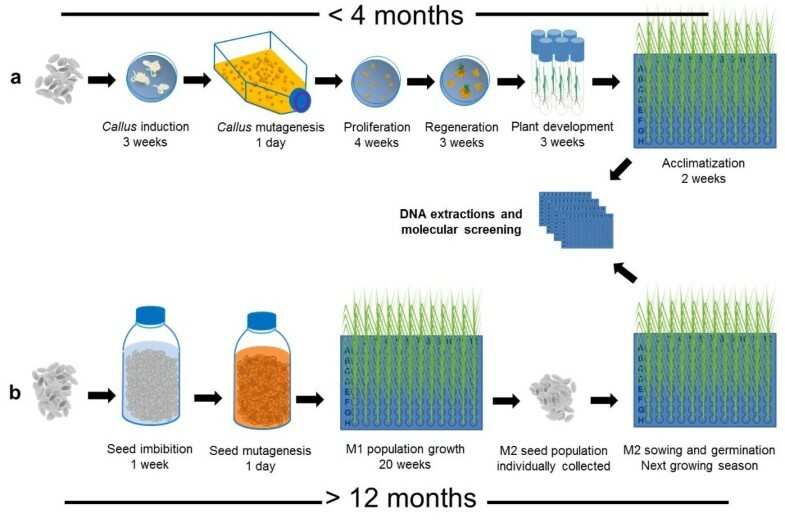 In order to till rice we followed a new approach that differs from the traditional TILLING procedure (described in the introduction section, see above, Figure 1) in two aspects: i) mutagenesis was applied to embryo-derived calli, and ii) mutational screening was carried out on regenerated plantlets after acclimatization. Diagram comparing callus mutagenesis and seed mutagenesis protocols in rice TILLING. (a) In the proposed rice TILLING protocol through callus mutagenesis, calli are induced, mutagenised, and the regenerated plants provide DNA for molecular screening of mutations. (b) In the basic TILLING method, seeds are mutagenised, the resulting M1 plants are self-fertilized and the M2 generation of individuals is used to prepare DNA samples for mutational screening while their seeds are inventoried. The steps represented cover from callus induction (a) or seed imbibition (b) to DNA extractions for molecular screening of mutations. Duration of each step is indicated. 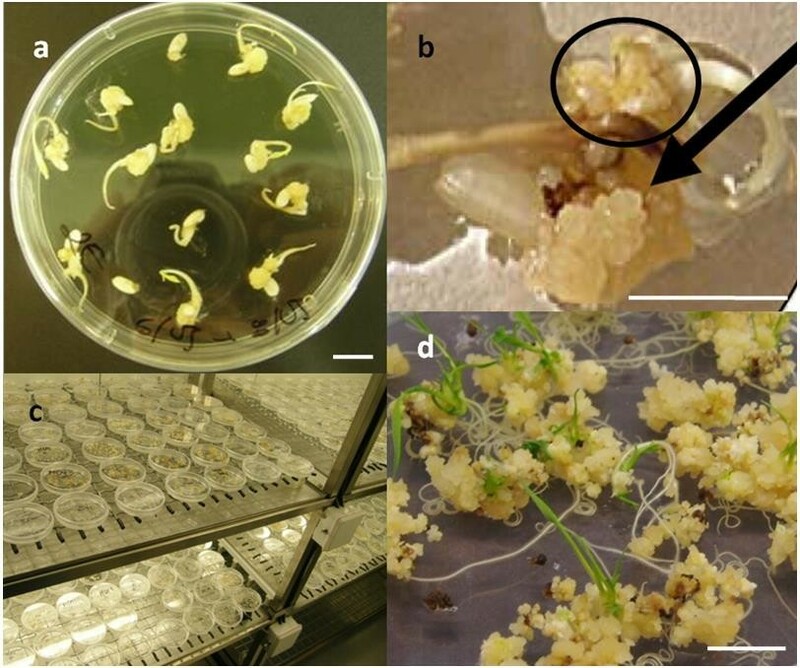 Rice seeds were cultured in callus induction media (OryCIM) for three weeks before Scutellum-derived callus masses were picked and mutagenised avoiding those calli obtained from the radicle (Figure 2a and b). No apparent differences were detected between partially disaggregated mutagenised and non-mutagenised calli except that the first showed a certain degree of browning. Both calli grew normally when cultured in OryCIM media for four weeks. Plantlets from both mutagenised and control calli started regenerating just three weeks after the growing callus masses were transferred to regeneration (MSM) media (Figure 2d). Mutant plantlets did not show any apparent phenotypic differences with respect to control plantlets. The control material was discarded after observing that the regeneration rate was satisfactory and similar in both treatments. Plantlets regeneration of Oryza sativa var. Hispagram from EMS mutagenised calli. (a) Oryza sativa cv. Hispagran dehusked seeds forming callus masses after 18 days culture in darkness using N6 medium supplemented with 0.5 mg L-1 casaminoacids, 1 g L-1 L-proline, 2 mg L-1 2,4 dichlorophenoxyacetic acid and 0.5 g L-1 2-(N-morpholino) ethane sulphonic acid. (b) development of a scutellum-derived callus mass (black arrow) and a callus mass growing from radicle (black circle), (c) and (d) plantlet regeneration from mature seed-derived callus (0.2% EMS mutagenised) in MS medium supplemented with 1 g L-1 casein hydrolisate, 3 mg L-1 kinetin, 0.5 mg L-1 6-benzylaminopurin, 0.5 mg L-1 1-naphtalenacetic acid and 0.5 g L-1 2-(N-morpholino) ethane sulphonic acid under 18/6 h light/dark cycles (details in Methods). Scale bar 1 cm. The callus regeneration process yielded 6912 individual plantlets obtained from 395 different mutagenised callus masses. From these, 2400 plantlets were sampled and their DNA was extracted, pooled fourfold and organized into a 96-well format for TILLING screening. Two target genes of agronomic interest were selected: OsACS1 (Os03g0727600) and OsSGR (Os09g0532000). Among the six ACS isozymes identified in rice, Os ACS1 is the most closely related (86% identity) to ACS6 of Zea mays (Swiss-prot: Q3ZTU2), a protein encoded by the ZmACS6 gene whose expression is largely responsible for directing natural, dark-induced and drought-induced senescence in maize [49, 50]. OsSGR exists as a single copy in the rice genome and is mapped onto the long arm of chromosome 9 . OsACS1 is a four exon rice gene that codes for a 487 amino acid protein [Swiss-prot: Q10DK7]. OsACS1 was screened in two fragments called OsACS1 1–3 and OsACS1 4. OsACS1 1–3 is a 1014 base pair (bp) fragment harboring the first three exons, while OsACS1 4 is a 1480 bp fragment spanning exon 4 (Figure 3). Targeted genes diagrams and PCR amplicons. Diagrammatic representation of the OsACS1 (Os03g0727600) (a) and OsSGR (Os09g0532000) (b) genes obtained by blast searches at NCBI. Exons are represented by dark green boxes, introns by dark red lines and 5′-UTR and 3′-UTR by pale green boxes. Exons are designated Exon 1-Exon 4 (OsACS1) or Exon 1-Exon 3 (OsSGR). Intron numbering follows exon numbering. Targeted screened gene segments (grey boxes) are designated ACS1 1–3, ACS1 4 and SGR 1–2. 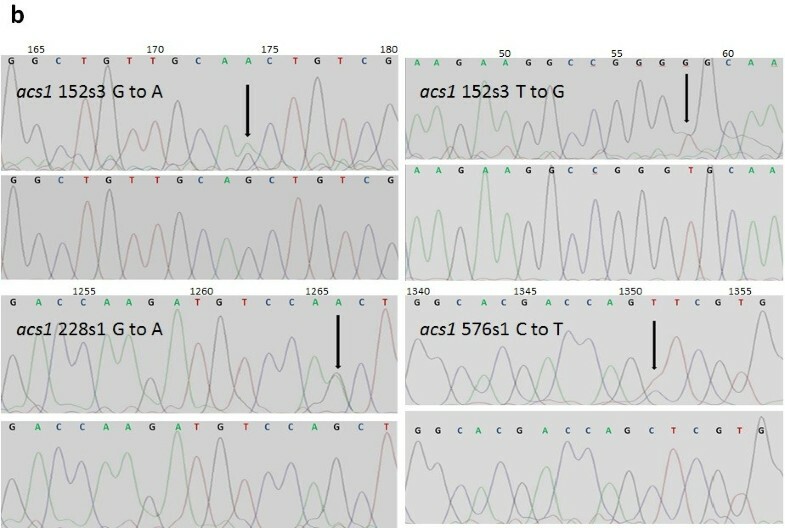 Figure 4 shows the detection of three OsACS1 mutants (acs1 152 s3, acs1 228 s1 and acs1 576 s1) based on different heteroduplex banding patterns (Figure 4a) and the identification of nucleotides changes by sequencing (Figure 4b). Acs1 152 s3 resolve into four bands of approximately 250, 450, 550 and 750 bp and has two missense mutations, T → G and G → A transitions at gene nucleotide positions 58 and 174, in the target fragment OsACS1 1–3 (Table 1). The G → A transition generates a modification (GT → AT) in the splicing donor site of the first intron. The T → G change resulted in the amino acid substitution C → G at position 20 in exon 1 (C20G, Table 1). Acs1 228 s2, acs1 398 s4 and acs1 576 s1 are missense mutations in the target fragment OsACS1 4 which result in the amino acid substitutions S314N, A246P and L354P at gene positions 1266, 1220 and 1351 bp respectively (Table 1). In addition, one mutation in intron 3 (acs1 43 s3, T → A at gene position 707 bp), one silent mutation in exon 1 (acs1 418 s2, C → T at gene position 84 bp) and one silent mutation in exon 3 (acs1 558 s2, G → A at gene position 535 bp) were detected in the OsACS1 1–3 fragment. Furthermore, two silent mutations in exon 4 coded acs1 83 s2 (C → T at gene position 1177 bp) and acs1 364 s2 (G → A at gene position 1669 bp), and one +73 bp C → T downstream mutation were also detected in the OsACS1 4 fragment (Table 1). A total of 11 nucleotide changes in the OsACS1 gene were detected after screening 2400 individuals. This is a one in every 457 Kb, 2.19 e-6 mutation frequency. Identification of OsACS1 mutants. (a) Heteroduplex mobility assays identifying three of the OsACS1 mutants (acs1 152 s3, acs1 228 s1 and acs1 576 s1). Denaturating polyacrylamide gel electrophoresis showing different heteroduplex DNA band patterns formed after PCR amplification and mismatch cleavage by Fennel Crude Extract (FCE) incubation. The presence of two bands of about 600 and 850 bp in the case of acs1 228 s1 sample and 700 and 750 bp in the case of acs1 576 s1 sample, indicate heteroduplex digestions in the 1480 bp amplicon (ACS1 4). The presence of two mutations in the same 1014 bp amplicon (ACS1 1–3) of the same individual (acs1 152 s3) generates four bands of about 250, 450, 550 and 750. M: molecular weight marker (100 bp marker, Thermo Fisher Scientific Inc.). Pool: positive mismatch pool formed by mixing four individual DNA samples. Arrows indicate mismatch digested bands. Lanes 2–5: individuals DNA samples of the positive mismatch pool. Mutant samples are indicated by bold number lane. (b) Identification of nucleotide changes by sequencing. Heterozygous acs1 mutants (upper panel) and wt (lower panel) sequences are represented. Black arrows indicate the base substitution. Direct nucleotide sequencing of the acs1 152 s3 mutant revealed the heterozyogus G to A and T to G transitions at gene nucleotides position 174 and 58 respectively which resulted in substitution of GT/AG at intron 1 5′UTR and the amino acid C to G change at position 20 (C20G). Direct nucleotide sequencing of acs1 228 s1 and acs1 576 s1 mutants revealed the heterozigous G to A and C to G transitions at gene nucleotides position 1266 and 1351 which resulted in substitution of amino acids S to N and L to P at amino acid positions 314 (S314N) and 354 (L354P) respectively. Confirmed acs1 and sgr mutants detected by TILLING screening and its predicted effect using GOR (Garnier-Osguthorpe-Robson) Secondary Structure Prediction application. The analysis of the deduced mutant amino acid sequences using the GOR (Garnier-Osguthorpe-Robson) Secondary Structure Prediction application  is summarized in Table 1. According to the Eukaryotic Linear Motif resource for Functional sites in Proteins (ELM) , the conserved functional motif (50–432 amino acids) of the wild type rice protein ACS1 is divided into two sub-domains 50–148 amino acids and 275–404 amino acids. The C20G (acs1 152 s3 mutant) change is located in the first functional domain and generates a weak α-helix domain modification (+1) (Table 1). The mutations L354P (576 s1 mutant) and S314N (228 s1 mutant) are located in the second functional sub-domain resulting in a loss and a weak modification of an α-helix motif respectively (Table 1). The change A246P (acs1 398 s4 mutant) does not affect any functional domain; it produces a complete α-helix domain lost mutation. Finally, the acs1 152 s3 mutant which has a GT → AT change at the intron 1 splicing acceptor site may affect splicing. OsSGR contains three exons that code for a 274 amino acid protein [Swiss-prot:Q652K1]. A single 926 bp fragment harbouring the first two exons was screened in this study (Figure 3b). Following the same strategy described above, one mutation in exon 1 (sgr 24 s1 G → A at gene position 67 bp), one mutation in exon 2 (sgr 389 s2 G → A at gene position 484), one silent mutation in exon 1 (sgr 855 s2 C → T at gene position 78 bp) and one mutation in intron 1 (sgr 854 s1 G → A gene position 238 bp) were detected after screening 2400 individuals. This is a one in every 436 Kb, 2.30 e-6 mutation frequency. The GOR application predicted that amino acid substitutions A23T and V127M induced modification in α-helix domains in exon 1 (sgr 24 s1) and exon 2 (sgr 389 s2) respectively (Table 1). Individual mosaicism was discarded after re-analysing 8 new independent leaf samples from all of the 14 detected mutant individuals, while the incidence of multiple clone regeneration was studied by revising mismatch cleavage results of all plants that had originated from the same callus which had regenerated the 14 detected mutant plants. In total, 112 leaf samples were subjected to mismatch cleavage detection and sequencing, resulting in no individual mosaicism (Additional file 1: Table S1). All the mismatch cleavage results from samples of plants that had originated from the same callus which had generated the 14 mutant plants resulted negative (Additional file 1: Table S1). In total 15 mutations were obtained in both target genes after screening 2400 individuals. This is a one in every 451 Kb, a 2.22 e-06 mutation frequency which is useful for reverse genetic studies and breeding proposes . Mutants were self-pollinated in order to obtain homozygous mutants. Selection was completed in two steps. First, in order to detect and discard heterozygous mutants, individual DNA was subjected to PCR amplification, denaturation and re-annealing to perform heteroduplexes, and FCE incubation and electrophoretic analysis to detect FCE-cut products. Then, with the aim of detecting and selecting homozygous mutants, individual samples of potential homozygous mutants selected in step 1 were mixed with wild type DNA (1:1 w/w). From this point onwards, screening was identical including PCR amplification, FCE digestion and electrophoresis. An example of this screening using 16 descendants of a self-fertilized sgr 389 s2 mutant is presented in Figure 5. In the case of heterozygous descendants, mismatch cleaved bands of 380 and 506 bp were observed, while no bands were detected in homozygous descendants (either wild type or mutants) (Figure 5a). In the second step, mismatch cleaved bands only appear in samples where wild type DNA is mixed with DNA from homozygous mutants (Figure 5b). Identification of homozygous mutants among OsSGR 389 s2 mutant descendants. (a) Electrophoretic analysis to discard heterozygous mutant plants obtained by self-fertilization of sgr 389 s2. Individual DNA samples were subjected to PCR amplification, denaturation, re-annealing, Fennel Crude Extract (FCE) heteroduplex mismatch cleavage and denaturing polyacrylamide gel analysis. The 926 bp band corresponding to the amplified fragment is present in all samples, while cleaved bands (380 and 506 bp) were detected in heterozygous mutant descendants (D4, D8, D10, E1, E4, E6 and E9). No cleavage bands were observed either in wild type or mutant homozygous descendants (D1, D3, D5, D6, D7, E3, E5, E8 and E10) highlighted in bold. (b) Electrophoretic analysis to discard homozygous wild type descendants. Homozygous descendants (D1, D3, D5, D6, D7, E3, E5, E8 and E10) individual DNA was mixed with wild type DNA (1:1 w/w) and subjected to PCR amplification, denaturation, re-annealing, FCE mismatch cleavage incubation and polyacrylamide gel analysis. Cleaved bands (380 and 506 bp) were detected in homozygous mutant descendants (D1, D3, D5, D7 and E10 in bold). Homozygous wild type individuals DNA could not form mismatches, and consequently no mismatch cleaved bands were visualized (D6, E3, E5 and E8). M: Molecular weight marker (100 bp marker, Thermo Fisher Scientific Inc.). Four wild type, 7 heterozygous and 5 homozygous mutant lines were obtained from the sgr 389 s2 descendants, Χ2 statistic for “goodness of fit” with the expected Mendelian segregations was Χ2 = 0.375 confirming the null hypothesis (2 degrees of freedom, p = 0.05) (Additional file 1: Table S1). Preliminary results indicated that they were completely fertile and showed a delayed senescence phenotype. In contrast, strong effect mutations of OsACS1 such as acs1 228 s1, 398 s4 and 576 s1 (Additional file 2: Table S2) were partially sterile, no mutant homozygotes were obtained and about 25% of seeds were unable to germinate. Segregations did not fit Mendelian segregation, but when scoring non-germinated seeds as lethal homozygous mutants, Χ2 test for goodness-of-fit with expected segregation resulted in Χ2 = 1.500, Χ2 = 1.444 and Χ2 = 0,200 respectively, being less than 5.991 when considering 2 degrees of freedom and p = 0.05 (Additional file 2: Table S2). A new rice callus mutagenesis protocol using EMS was established. Mutant plants were efficiently obtained by mutagenizing scutellum-derived callus masses containing primary, embryogenic and non-embryogenic calli (Figure 2). Root callus was the only callus mass to be discarded as it is unable to regenerate plants and it is easy to identity as it grows separately from the radicle. The expensive and time consuming embryogenic callus selection process which is commonly used in transformation protocols proved to be unnecessary for successful callus mutagenesis, since embryogenic calli are contained in scutellum-derived callus masses  (Figure 2b). In order to ensure sufficient callus availability 1,200 Hispagran seeds were sown, although only less than 20% of total calli was used for mutagenesis. It would have been possible to mutagenise the same amounts of calli using less than 200 callus forming seeds, although the capability of obtaining and regenerating embryogenic callus depends on the cultivar and culture media used . Nevertheless, it is highly recommendable to use mutagenesis flask replicates in order to ensure that fungal and/or bacterial contamination free in vitro material is obtained. In general, in seed-propagated plants, the chemical mutagenesis protocols use a seeds under germination process, so that the mutagen has to be absorbed by the germinating embryo and reach the meristematic region where the germ cells are contained. Other alternative plant material has been mutagenised, such as pollen, microspores, single zygotic cells in recently fertilized eggs and suspension cultured cells. Although pollen mutagenesis has been performed in maize, no pollen mutagenesis attempts have been reported to date in rice as pollen lifetime is too short and manual pollination is much more complicated than in maize [56–58]. Iftikhar and Mumtaz  mutagenised microspores using EMS for a practical mutation breeding programme in the genetic improvement of oilseed brassicas. On the other hand, Suzuki et al. found high mutagenesis rates when treating single zygotic cells in recently fertilized rice spikelets by using N-methyl-N-nitrosourea. However, a low cell survival was obtained and the resulting seeds (M1) had to be grown, fertilized and harvested until the M2 population was ready for screening. Recently, suspension-cultured cell mutagenesis using EMS has been reported  where regenerated mutant plants were self-pollinated in order to obtain 302 M2 lines for phenotypic analysis in field conditions which subsequently achieved high mutagenesis rates. In this context, callus mutagenesis is more effective when compared to the traditional mutagenesis technique in seeds since this technique allows the mutagen agent to easily reach the target uncoated embryogenic cells rather than complex fully-formed embryos. Considering that somatic embryogenesis is the main regeneration method in the culturing of rice in vitro, and that somatic embryos arise from single cells, each mutated single cell can develop into a somatic embryo and regenerate a mutant plant. . Furthermore, all mutants were unique; no clones were detected in the mutant population after screening the whole population and upon revision of all the results involving any plant that had shared the same callus of origin. The intensity of mutagenesis applied is an important component in a TILLING project, and it is necessary to find a compromise between mutagen toxicity, genome mutation saturation and possible accumulation of undesirable phenotypes. In our study, 0.2% EMS for 2 hours was effective to generate a whole rice mutant population with a sufficiently high mutation density. This mutagen dose applied in order to mutagenize rice seeds is in the range of values (0.2-2%), however, the duration of treatment is lower, 2 hours versus 6 hours reported by Chakravarti et al. (0.2% EMS), and 12 hours reported by Wu et al. (0.4% to 1% EMS) and Talebi et al. (0.25 to 2% EMS). Regarding rice cell culture, Chen et al. reported that a treatment of 0.4% EMS for 18–22 hours is optimal in order to induce mutagenesis. Consequently, the effectiveness of our low doses and low volume of mutagen presents an advantage since it implies a considerable financial saving and reduces the amount of residues generated. The mutagenized callus regeneration rate was similar to that of non-mutagenized control calli, which means that this treatment neither causes apparent lethality, which is one of the main problems associated with chemical mutagenesis , nor affects the plantlet regeneration rate. Characterization of the two mutant populations obtained through screening with ACS and SGR target genes revealed mutation densities of 1/457 kb and 1/436 Kb, respectively, which are satisfactory and suitable for high throughput TILLING . These mutations densities are in the range of those found by Wu et al. (1 per 1 MB for cv. IR64) , Till et al. (1 per 300 Kb for cv. Nipponbare)  and Suzuki et al. (1 per 135 Kb for cv. Taichung 65)  using rice seed mutagenesis protocols. In twelve out of 15 mutants the most common EMS induced mutation was present, which is the C/G to T/A (C → T or G → A) substitution [9, 12], while one case of G/C to C/G (C → G) transition was detected as expected in Arabidopsis EMS mutagenesis experiments . Although T → A transversions are the second largest expected in Drosophila EMS mutantagenesis experiments , T → A and T → G detected transversions were unexpected in EMS rice mutagenesis. The origin of these mutations is unknown. We used 1200 seeds obtaining 395 callus masses which subsequently regenerated 6912 plantlets, and from these, 2400 individual mutants were screened. Polymorphisms in the Hispagran cv. seeds batch used to generate the mutant population could not explain these mutations since at least more than one other identical mutant should have been found, however all mutants were unique and furthermore, no other identical mutants were observed within the mutant population, even in those sharing the same callus of origin. In this work, mutations were detected using a heteroduplex digestion assay with crude fennel juice extract (FCE) instead of crude celery juice extract (CJE)  or CEL I nuclease from celery, the most common enzyme used in TILLING projects [42, 64]. The disadvantage of using juice extracts is that they contain multiple mismatch-cleaving enzymes which collaborate in the digestion of heteroduplex DNA substrates. However, Till et al. concluded that juice extracts and highly purified preparations in optimal conditions yielded similar mismatch detection results. Crude FCE exhibits lower mismatch-cleavage activity than that of CJE  however, it cleaves A/C and T/G mismatches preferentially, matching them with the most likely substitutions induced by EMS treatment, while the commercial CEL1 purified enzyme cleaves C/C mismatches preferentially . In addition, it is inexpensive when compared with the substantially higher cost of the CEL I purified enzyme. Nevertheless, FCE nucleases mismatch cleavage was under study, and its 3′-5′ exonuclease activity and other aspects implied the need for specific incubation conditions . Functional analysis of the acs and sgr rice mutant lines would be needed in order to shed some light on the segregation of these genes and the roles that they play in the improvement of rice culture (i.e. delayed senescence and increase in rice yield), through performing field trials. To date, we are not able to predict the effect of OsACS1 mutations on senescence since the amino acidic changes detected do not affect critical amino acids for catalysis, interaction and correct orientation of pyridoxal 5′-phosphate and substrate recognition  or any of the seven strongly conserved regions described by Wong et al. . With respect to sgr mutants, the A23T and V127M changes do not correspond to amino acids critical for the correct functioning SGR proteins of rice [51, 70], pepper and tomato . As far as we currently know, all rice sgr recessive mutants obtained to date [51, 70] belong to non-functional type C–sgr mutants in which chlorophylls are retained in senescent leaves as their photosynthesis efficiency decreases . Given that SGR is a highly conserved protein in plants and does not show a large degree of similarity to any other proteins, we are not able to predict the effect of the two mutations which were obtained. Homozygous lines obtained from both mutants are completely fertile, and they remain greener longer than in Hispagran plants. Therefore, these results suggest that they could be functional stay-green rice mutants. If this is the case, these mutants could be the first functional sgr mutants in rice to have been found and they could potentially be useful for rice improvement. On the other hand, if these mutants produce a non-functional SGR phenotype, they would be useful for the study of the chlorophyll degradation pathway. Further work is now underway to understand the effect of these mutations on rice. In conclusion, our results showed that combined EMS mutagenesis in callus with FCE heteroduplex digestion assay is a powerful tool for the identification and genetic characterization of rice mutants. In our study, we were able to identify 15 nucleotide changes. The estimated mutation density is in the range of that previously reported for rice. Our mutagenesis protocol avoids the problem of the inhibitory effect of the mutagen on seed germination and can be adapted to any callus induction/regeneration media with two modifications which are: the removal of agar and the addition of antioxidants during mutagenesis and rinsing. In addition, callus mutagenesis makes it possible to rapidly obtain a mutant population with a time saving of more than eight months when compared to classical seed mutagenesis. Furthermore, it saves greenhouse resources and work, the amount of mutagen needed to produce a mutant population and, consequently, the amount of residues generated. This methodological approach could be easily adapted to any rice variety or even other plant species (e.g. cereals) and also cell suspensions. Hispagran temperate japonica rice (Oryza sativa) cultivar is a high yielding variety grown in Extremadura and Seville (Spain). Certified Hispagran seeds were supplied by the Instituto Hispánico del Arroz, S.A. (Hisparroz). The possibility of polymorphisms in targeted gene fragments of Hispagran was studied in advance by sequencing the targeted fragments in 80 wild type Hispagran individuals. The nucleotidic sequences were compared with the GenBank database of Nipponbare japonica rice cultivar (GenBank: AP008209.2). To ensure enough calli were obtained, 1200 Hispagran certified seeds were dehusked and surface disinfected after soaking and stirring for 1 minute in 70% ethanol followed by 30 minutes in bleach sterilization solution; 40% commercial bleach supplemented with 8 drops of Tween 20 (Sigma-Aldrich, Madrid, Spain) per litre. After five rinses (5 minutes per rinse) using sterilized water, seeds were sown in solid Callus Induction Media (OryCIM), based on rice Callus Induction Media  that was optimized to Mediterranean japonica rice varieties; Chu N6  standard salts and vitamins were supplemented with 0.5 g L-1 casaminoacids, 1 g L-1 L-proline, 2 mg L-1 2,4 dichlorophenoxyacetic acid (2,4 D), 0.5 g L-1 2-(N-morpholino) ethane sulphonic acid (MES), and 30 g L-1 sucrose. The pH 5.7 was adjusted using 1 M KOH solutions and 2.5 g L-1 Gelrite™ was added before autoclaving. Sterilin 90 mm petri dishes (Sterilin LTD, Cambridge) were filled with 25 mL media after autoclaving. Fourteen sterilized seeds were sown in each OryCIM petri dish, and plates were sealed and incubated for three weeks in complete darkness, at 28°C (Figure 6). Contaminated seeds were discarded and scutellum-derived callus masses growing close to the embryo were selected avoiding smaller root producing calli growing from the radicle . All media components were supplied by Duchefa (Duchefa Biochemie BV, The Netherlands) with the exception of casaminoacids (Becton, Dickinson and Company). Schedule of the experiment. Schematic representation of TILLING schedule based on callus mutagenesis. The duration of each step (weeks, w) is indicated. Callus masses were transferred into three 375 mL NUNC EasyFlasks™ with filter caps for continuous venting (Thermo Fisher Scientific Inc.) containing 96 mL OryCIM liquid media without 2,4-D, but supplemented with 125 mg L-1 L-ascorbic acid and 125 mg L-1 citric acid (Liquid OryCIM) to prevent callus oxidation in further callus mutagen treatments. Callus masses were transferred until the final volume reached 110 mL in each flask. Next, two flasks were immediately mutagenised by adding EMS (0.2% v/v) (Sigma-Aldrich, Madrid, Spain) following the safety instructions provided by the manufacturer’s Material Safety Data Sheet (MSDS). No EMS was added to the control flask. Flasks were placed on an orbital shaker (150 rpm) and covered with aluminium foil to avoid light for two hours. After incubation, every callus batch was rinsed ten times using 200 mL liquid OryCIM media and removing it after 3 to 4 minutes. After rinsing was complete, calli were incubated on modified liquid OryCIM media which was supplemented with 2 mg L-1 2–4 D and shaken (120 rpm) for two additional days (28°C, darkness). Calli were partially dried in a laminar flow cabinet on sterile cellulose paper for about 30 minutes before sowing them in solid OryCIM fortified with 4.5 g L-1 Gelrite™ (Duchefa) in 90 mm diameter dish. Fourteen callus masses per dish were transferred and cultured for four weeks in darkness at 28°C (Figure 6). Calli were transferred to regeneration media (MSM) petri dishes (90 mm diameter) and cultured under a 18/6 hours light/dark photoperiod under 70 μmol m-2 s-1 fluorescent light, and at 28°C until plantlets were fully-formed 30 days later. This MSM media was based on MS  standard salts and vitamins, fortified with 1 g L-1 casein hydrolisate, 3 mg L-1 kinetin, 0.5 mg L-1 6-benzylaminopurine, 0.5 mg L-1 1-naphthaleneacetic acid, 0.5 g L-1 MES and 30 g L-1 sucrose. The pH was adjusted (5.8) by using 0.5 M HCl solution and 4.5 g L-1 Gelrite™ was added before autoclaving. Calli were transferred every three/four weeks to fresh MSM media until the end of the experiment ca. 22 weeks (Figure 6). Regenerated plantlets were individually numbered and its callus mass origin was recorded as soon as they were sub-cultured into culture tubes (17 cm high/2 cm width) filled with 10 mL of root media (RM) . Plants were cultured for three more weeks to enhance rooting and leaf development under a 18/6 hours light/dark photoperiod 70 μmol m-2 s-1 fluorescent light, at 28°C (Figure 6). Rooted plantlets were ex vitro acclimatized (Figure 6) as follows. Media was carefully removed from roots using tap water and plants were transplanted into 96-well multi-pots, each pot filled with 35 cm3 of specially designed Floratorf™ peat moss (Floragard Vertriebs, Oldenburg, Germany) - vermiculite (2:1 v/v) substrate that was supplemented with Osmocote™ (The Scotts Company LLC, Ohio, USA) controlled release fertilizer mix [Osmocote Exact™ (15 + 9 + 9 + 3 MgO + micronutrients) 6-month release and Osmocote™ high K (11 + 5 + 15 + 1.2 MgO + micronutrients) 9-month release (1:1), 1gr L-1 of substrate]. Then 1 gr of CaCO3 per peat litre was added to adjust the substrate to pH 6. Multi-pots were placed in 54 × 31 × 4.6 cm plastic trays with holes ensuring a maximum 1 cm flooding irrigation. Supplementary fertilization was supplied during panicle formation period by adding high ammonium (50% total N) soluble fertilizer (NPK 19 + 6 + 6) supplemented with 4% w/w micronutrients and 4% w/w iron chelate diluted in osmotized water, final electro-conductivity was adjusted to 1000–1200 micro Siemens. The mutants identified by the TILLING screening were transplanted from multi-pot wells to 4 litre pots to obtain as many seeds as possible, while the rest of plantlets growing in multi-pots where discarded as soon as a minimum 20 seeds per plant was obtained. Seeds were collected in individually labelled envelopes, and stored as if they were an M3 mutant population generated by seed mutagenesis (Figure 6). About 0.5 cm2 of newly formed leafs were sampled from each plant using 96-well sample boxes containing 50–100 μg quartz (Merck KGaA, Darmstadt, Germany) and two 4 mm glass balls (Merck) placed on ice in polystyrene boxes to avoid DNA degradation. Samples were stored at -80°C and the completely frozen material was disrupted for 1 minute using a Mixer Mill (Retsch). Genomic DNA phenol-chloroform extraction: 200 μl buffer 1 (100 mM Tris–HCl pH 8, 50 mM EDTA pH 8, 500 mM NaCl and SDS 20%) was added to each sample and boxes were incubated at 65°C for 30 minutes. Two hundred μl of phenol:chloroform:isoamyl alcohol (24:25:1) was added to every extraction tube and the entire box was vortexed before being centrifuged at 3,000 rpm for 30 minutes at room temperature. Two hundred and twenty μl from the upper phase was transferred to a clean 96-well plate and kept for further analysis. DNA quality and quantity were determined with a combination of electrophoresis gel analysis and gel determination software and the same amount of DNA from 4 distinct plants was pooled together and organized into 96-well format, this being the starting material for TILLING mutant screening. The ZmACS6 gene is involved in senescence regulation and drought tolerance in maize [49, 50]. Several ACS genes were found in rice and maize after a BLAST was performed using the ZmACS6 protein sequence. OsACS1 was selected as the best candidate after homology studies using CLUSTAL W2 . OsSGR has been related to Chlorophyll catabolism . These two genes were selected as target genes. Primer design was carried out using the Primer 3 program application . A set of primers (OsSGR 1–2) was designed to amplify the first two exons of OsSGR. Two sets of primers were designed to amplify 2 segments of the OsACS1 gene: The first segment (OsACS1 1–3) was designed to amplify from the first to the third exon, and the second (OsACS1 4) was designed to amplify the fourth exon (Figure 3) (Table 2). Eighty plants were sequenced for OsACS1 and OsSGR fragments and compared with Nipponbare japonica cultivar sequences available at NCBI. Primers were designed using Primer3 application and used for the OsACS1 (Os03g0727600) and OsSGR (Os09g0532000) molecular screening of mutations. F: forward. R: reverse. Position of amplicons are shown in Figure 2. Fragments of target genes were amplified by polymerase chain reaction (PCR) using 1–4 ng DNA, 200 μM dNTPs and 0.4 μM Hispagran genome specific primer sets (Table 2), and 5U Pfu DNA polymerase in 20 μL 1X Pfu DNA polymerase reaction buffer including 1X final concentration of 2 mM MgCl2 (Fermentas). The number of cycles, the times and the annealing temperatures were optimized for each specific primer pairs. DNA denaturation and slow re-annealing step (from 95°C to 4°C) processes were added to the end of the PCR amplification thermal cycle programs in order to induce heteroduplex DNA formation within the different amplification products obtained from the pools. An aliquot of each PCR product (ca. 5 μL) was checked on a 1% w/v agarose gel and submitted to electrophoresis to verify the efficiency of the PCR amplification and the size of the amplified product. The amplified DNA from each pool was subsequently incubated with FCE  for heteroduplex mismatch cleavage: 80 ng of heteroduplex DNA, 1 μl FCE, 20 mM Tris–HCl pH 7.5, 25 mM KCl and 20 mM MgCl2 (final volume 10 μl). After 30 minutes incubation at 45°C, the reaction was stopped by adding 2 μl of stop buffer (20 mM Tris–HCl pH 8, 10 mM EDTA, 12.5% v/v Glycerol, 50% v/v Sybr gold-dimethyl sulfoxide and 0.05% w/v Bromophenol Blue). Digested samples were size-fractionated by polyacrylamide gel electrophoresis (4% acrylamide:bisacrilamide 19:1 in Tris/Borate/EDTA supplemented with 0.008% v/v tetramethylethylenediamine and 0.002% w/v ammonium persulphate) at 300 V and 15–20 mA for 1.5 hours . Results were analysed using a Typhoon 8600 scan (GE Healthcare) with a fluorescein filter (526 nm) for Sybr-Gold stain detection. Individual plates containing the four individual DNA samples from each positive pool were similarly analysed after mixing (1:1, w/w) with control wild type DNA. PCR product from validated individuals were purified using Microcon™ filters purification kit (Millipore) and 5–40 ng (depending on DNA fragment length) were sequenced on a ABI Prism 3700 (Applied Biosystems) sequencer using Terminator polymerase (Applied Biosystems). In order to detect mosaicism, 8 DNA samples from eight different leafs from all 15 identified mutants (120 samples) were extracted and subjected to targeted fragment amplification, mismatch formation, enzymatic digestion gel analysis and sequencing. Furthermore, wherever a mutant plant was detected, plants that had originated from the same callus were tracked and the results of the analysis were carefully revised. The nucleotide sequences were analysed using Chromas Lite 2.1 (Technelysium Pty Ltd) giving the nature and the exact localisation of the mutation within the gene. Mutant amino acid sequences were submitted to the GOR (Garnier-Osguthorpe-Robson) Secondary Structure Prediction application  and listed in Table 1. The mutation rate was calculated by dividing the total number of observed mutations by the total surveyed DNA length. The total surveyed DNA length was calculated by the sum of the screened individuals multiplied by the base pair (bp) sum of amplified fragments. We subtracted 200 bp from each TILLED fragment to account for the difficulty in detecting digested DNA products that migrate in the top and bottom range of the gel like other authors . This work has been carried out as part of the HISPA Project for the INSTITUTO HISPANICO DEL ARROZ SA (HISPARROZ) “Mejora del rendimiento de la variedad Hispagran y reducción del tamaño y mejora del rendimiento de la variedad Bomba de arroz mediante mutagénesis química”. S.N. would like to thank the OPTIMA and PALEOISOCROP projects for their financial support. XS adapted in vitro culture media, mutagenesis and regeneration protocols. XS and EL conceived the study and carried out the callus mutagenesis. XS directed the In Vitro process. NG and RE designed the molecular screening and developed the FCE endonuclease mismatch cleavage detection. XS drafted the manuscript. The final script main contributors were XS, SN, LM and RE. All authors read and approved the final script.